Which Amazon gadget suits you? 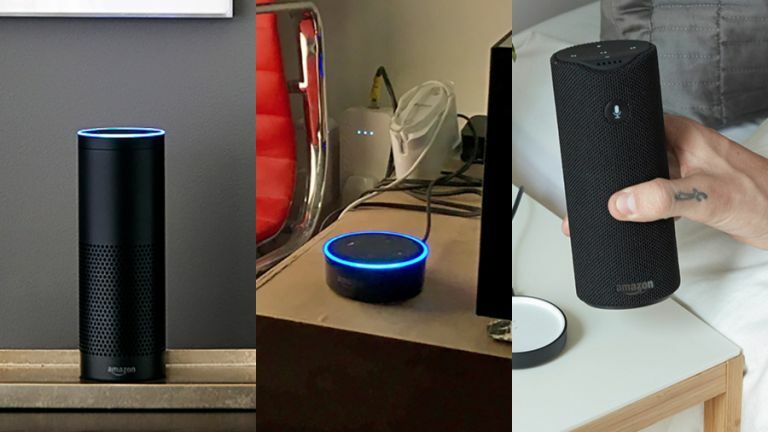 So you've decided you're in the market for an Echo speaker - or maybe you're wondering how your existing device matches up against the others - so what are the differences between the original Amazon Echo, the smaller Echo Dot, and the portable Amazon Tap. Here we'll lay out the details for the three devices, from retail prices to built-in features, so you'll never again be confused about the differences between them. Don't forget you do have other options too, with Alexa coming to a number of non-Amazon devices as well. It seems like the Amazon Echo has been with us forever, but in fact the talking speaker only appeared on the scene in November 2014, and then only to a select few. A wider roll-out in the US happened in the summer of 2015, and since then the Echo has been expanding into more territories across the world. The speaker has also been getting cleverer all the time, thanks to the smarts Amazon and other developers have been adding to Alexa, the on-board digital assistant. Alexa is of course what makes the Echo different from other Bluetooth speakers out there - not only can you stream your tunes to it, you can ask questions, order products from Amazon, play music with a voice command, call an Uber, and much more. In March 2016, Amazon introduced the Echo Dot (which cut out the speaker and kept the Alexa brains) and the Amazon Tap (which added portability to the speaker). First up in our comparison, the original Amazon Echo, yours for £149.99 or $179.99. It's the oldest and the biggest device out of the three, standing 235 mm (9.25 inches) high with a diameter of 83.5 mm (3.29 inches). It's Bluetooth-compatible, so you can stream audio to it from a bunch of other devices, but there's no line-in port for connecting anything else directly. It also has to be plugged into a power source at all times. The real star of the show is of course Alexa, Amazon's smart digital assistant that lives inside the Echo and can do everything from controlling your smart home to playing your music from Spotify. There are tens of thousands of actions (or "skills" as Amazon calls them) you can try out, and new ones are being added all the time. Because Alexa and its associated mobile apps can be constantly updated in the cloud, the Echo will never really go out of date. Simply put, the Echo Dot keeps the smarts of the original Echo while cutting down the integrated speaker, so you really need to plug it into a speaker of your own for music and loud audio. It's currently retailing on Amazon for £49.99 or $49.99. At that sort of price it's the obvious choice if you have an existing speaker or hi-fi system you can make use of - the Echo Dot essentially adds some Alexa intelligence to the music setup you've already got in place. It works with Bluetooth and unlike the full-sized Echo there is a 3.5mm audio port for attaching other speakers. The Echo Dot is the same diameter as the speaker that came before it but obviously a lot shorter, just 32 mm (1.26 inches) in height - another reason to get this over the main Echo would be that it fits into a much smaller space. You save a lot of money for essentially the same device - but you do need to bring your own speaker to get the most out of it. The easiest way to think about the Amazon Tap is as a portable Amazon Echo - it can run from battery power or the mains, so you can take it anywhere with you, and it currently retails for $129.99 (around £105, though it hasn't officially been launched in the UK yet). One key difference the Tap had at launch was that Alexa wasn't always listening - you had to push a button to speak out your commands (presumably to save battery life). Amazon has since added an always-on mode to the Tap though, so this distinction no longer applies when comparing the Tap to the Echo. And considering the Amazon Tap does everything the Amazon Echo does but in a smaller package, and with the option of portability, and at a cheaper price, and in more colours, a lot of people say that this is the device to get out of the three. It stands 159 mm (6.26 inches) high and weighs 470 grams (16.6 ounces). Alexa is present and correct of course, so you can connect up to all those skills and services with ease. All of these devices have their own pros and cons. The most expensive, original Amazon Echo wins for being the biggest device with the best sound, though it's perhaps the newest bits of hardware that offer the most value. The Amazon Tap is a no-brainer if you want to take Alexa on the go with you, as long as you live in the US and can get hold of one. It's going to work fine in the home too and is significantly cheaper than the Echo that came before it. The Echo Dot, meanwhile, is the cheapest way of getting an Echo in your home, but only really makes sense if you've got an existing speaker setup. As you can set up multiple Echo speakers in your home, you might find a mix of these devices works best, so that's another option to consider. Ultimately you're getting the same access to Alexa, Amazon's digital assistant that's always learning new tricks, so you don't need to worry about whatever device you get becoming obsolete in the near future.